GLBB office on Highway 58 in Sunabe. For most of us and especially for those serving overseas, Internet services are now a necessity and not simply a convenience when communicating with others, and when service is not fast and dependable, frustrations quickly mount. 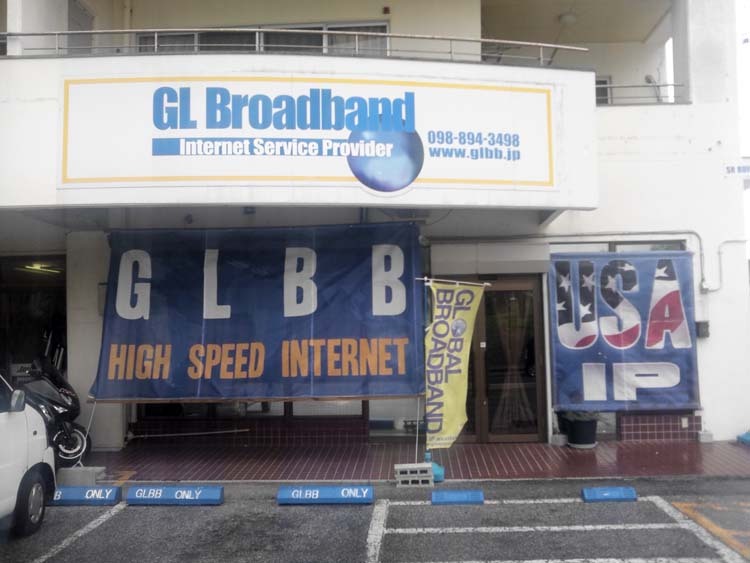 Internet service provider GLBB Japan provides high-speed optical transmission system and IP telephone services, but has taken their service to an even higher level with pre-wired apartments across the island that includes high-speed internet connections. GLBB Mansion type internet is a service provided to apartment and mansions pre-wired by GLBB. Generally all mansions have a 1Gbps connection. In areas fiber is not available; they are connected via laser heads or wireless connections to make connections possible. GLBB says their services are top-of-the-line, providing equal internet quality to every apartment so users do not encounter problems of speed “getting bogged down at night”. A contract with GLBB usually results in same-day installation service and internet access in these pre-wired apartments, rather than users having the inconvenience of waiting days or weeks for service. The high speed makes it easy to play online games and movies. These apartments are very convenient and reduce the hassle of formalities or any type of installation. The price is also extremely reasonable, with a monthly flat-rate system of only ¥4,500 with no usage limits. The first month is ¥5,000 and covers initial expenses. Also, there is no contract period, meaning no worries of paying cancellation fees in case a sudden move occurs. A 24-hour network management system overlooks the mansions and in case trouble occurs, there will be immediate response in English. The apartments have various sizes for singles and families. GLBB currently serves pre-wired units in Okinawa City, Chatan Town, Ginowan City, Kitanakagusuku Village, Nakagusuku Village, Uruma City, Kin Town and Ginoza Village.